A more than $400 million spending plan for one state agency has gotten final approval in the legislature and is headed to the governor for approval. All the money for the Iowa Department of Transportation’s next budgeting year comes from the state’s tax on motor fuels and the taxes and fees for vehicles. The House and Senate have approved hiring eight new DOT employees who will be based in central Iowa. 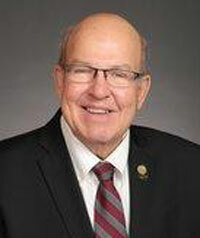 “We are establishing, as more people move to the western suburbs of the Des Moines metropolitan area, a new drivers license location in Dallas County,” said Representative Gary Mohr of Bettendorf, the Republican in charge of shepherding the DOT’s budget through the House. As Radio Iowa reported earlier this week, the DOT’s budget plan includes nearly $9 million extra to restock the road maintenance sheds where salt is stored for next winter. Lawmakers have also approved a $27 million plan to consolidate five DOT facilities in the Sioux City area into one location.